Introducing Bruce - Keeping our grounds looking great. 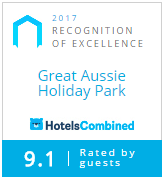 If you ever wondered how we keep Great Aussie Holiday Park looking so good, then wonder no longer. Introducing Bruce – our Groundsman. To help you get to know Bruce, he has answered a few questions. I grew up in Brocklesby, which is pretty local (it’s only about 50km’s from Bowna, as the crow flies). I have had a few jobs over the years, including car detailing (21 years), manager, real estate sub-contractor, gardener and now groundsman. I love the size and the lifestyle about our region. Everything is at your doorstep – every season. I get enjoyment out of the role and a real sense of satisfaction when the job is complete. Being outdoors and the team here are great mates. If you see Bruce out and about, be sure to say hi!